Spring Fling Weekend every year features an old fashioned engine show where the exhibitors have plenty of room to set up their engines and, park or even camp with their display, and swap parts, engines or just stories. There are no tractor displays in the spring. Along with the engine exhibits is a flea market / yard sale area operating the entire three day weekend, a two day consignment auction, and antique tractor and garden tractor pulls. Smaller and more compact that the fall flea market, it is also more affordable for the smaller dealer and the serious yard seller. Open all three days, it is well attended by the usual yard sale crowd and also auction bidders, engine exhibitors and pull crowds. The yard sale /flea market spaces cover 2 distinct areas, one near the garden tractor display and the other near the consignment auction. Be sure to ask for placement in the area of your choice. This year our auction will be held on 2 days with Friday being the estates of Chuck Noonan and Art May, both long time active Society members. 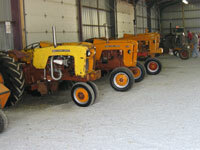 Chuck's sale will include Case tractors and Equipment, tools, shop and barn items. 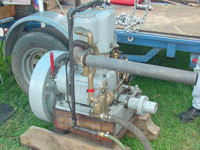 Art's sale will include Graham Bradley, Handyman, and CoOp tractors, parts and equipment. Aldso tools and shop equipment. A detailed salebill can be obtained by contacting Sue Knaub at 717-244-1912 or email at steamorama@aol.com before April 25. The Friday evening Consignment Auction will be held starting at 5:30 as usual. Our consignment auction has been growing steadily through the years. We are currently accepting items for the auction including toys and smaller collectibles, sales literature, antiques, pedal tractors, etc for the Friday night sale; and farm equipment, tractors, implements, gas engines and related items, and law and garden items for the Saturday sale. Our commissions are competitive, our auctioneers are all local, experienced and volunteers. The proceeds from the sales go toward maintenance and upkeep of the grounds and to the various groups the Society supports such as local 4-H activities, the Farm and Natural Land Trust, and various area youth groups. We offer competitive rates, convenient drop off times and loading docks and equipment. Call Sue Knaub at 717-244-2912 or Charles Stillinger at 717-916-0407 for details and contracts. Garden Tractor Pulls Hosting the 2019 Rude Dog Nationals conducted by Bob Ansell. Saturday May 4 Weigh-In at 1pm and Pull at 2pm. For rules and details call Bob at (717) 471-9598 or visit his websight http://rudedogtractorpullers.webs.com. Saturday, May 5 and Sunday, May 6 with set-up on Friday May 4. For 2018 Bob Rentzel and the Little Guys Tractor Club bring their show to the Steam-)-Rama Spring Fling Weekend. Their features this year is cub Cadet and Pensylvania Panzer. In addition will be the 14th USA National Motorized Pedal Tractor Meet and the 29th PA Garden Tractor Plowing Contest. Follow the blue arrows to the meet area. Admission is free to everyone and additional flea market in this area is available. For flea market forms and information concerning the event contact Bob Rentzel at 717-840-1044.